In our first ever post in Geotechpedia’s blog we tried to answer the most common question among professionals in the Geotechnical engineering industry “Geotechnical Investigation data, always not enough?”. In the specific post, it has been mentioned that “some of us proudly state “I saved so much by reducing the geotechnical investigation” but all this immediately changes when something goes wrong”. We are all aware of how limited or inadequate Geotechnical Investigation (GI) can affect both a project’s schedule and budget. In the following lines, we are trying to quantify these effects, provide guidance on how to easily create a risk scoring matrix and attributed risks, typical geotechnical risks and related mitigation measures. Back in 1748 Benjamin Franklin stated “Time is money” in his “Advice to a Young Tradesman”. This quote finds application in all business sectors and the engineering one couldn’t stand out as an exception. In every project, delays are translated into cost and as such we are going to examine the estimated cost effects of delays deriving from inadequate Geotechnical Investigation on a project’s total construction budget. The most common chart when discussing the risk management in geotechnical engineering is presented below (Figure 1). It is obvious that for low values (1% approximately) of Geotechnical Investigation cost / tender cost (adjusted values), the total increase in construction cost may vary between 2% and 98% with an average value of 15-25%. 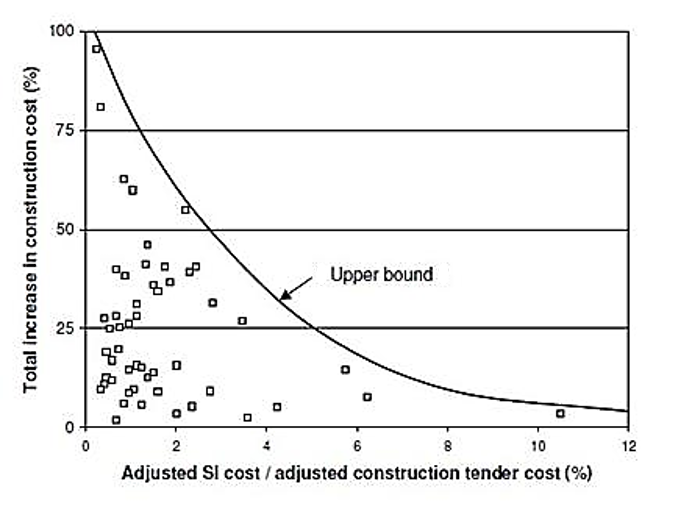 When the Geotechnical investigation budget is slightly increased (adjusted Geotechnical Investigation cost / construction tender cost values between 2 and 4%) then the total increase in the construction cost drops to a typical range of 2% to 25% with an average value of 5-10%; meaning that an increase of 1-2% on the construction tender cost for additional Geotechnical Investigation signalizes a significant drop of approximately 25 to 50% (absolute values) in the total construction cost. During the tendering procedure of a project, a risk assessment needs to be undertaken in order to evaluate the geotechnical risks at an early stage and propose mitigation measures. The following table (Table 1) presents a typical and simple scoring matrix that can be used in this kind of assessments and Table 2 details the specific risks associated with geotechnical works and categorizes them into probability of occurrence and cost/time impact. The purpose of the following matrix is to help rank the key risks on site. Scores of 1-5 are allocated to the probability and impact in order to quantify and rate the risk rating. 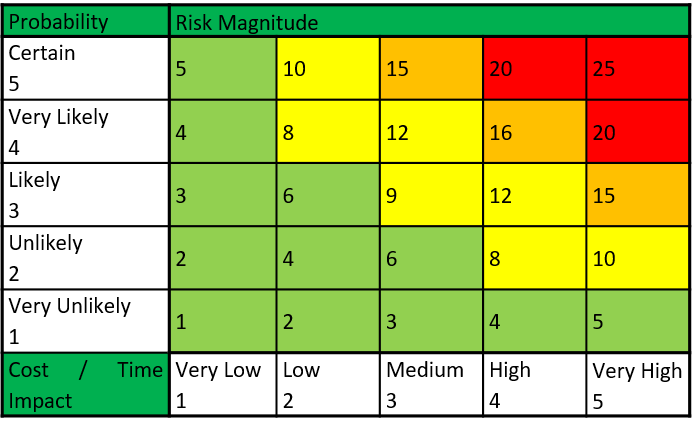 The risk scoring matrix should be used in conjunction with the priority action table detailed below (Table 2). Successful implementation of the suggested mitigation measures will assist with managing and reducing known risks to acceptable levels. Table 3 below presents typical risks/hazards, related impact on construction budget and proposed mitigation measures. In general, Geotechnical Risk Management gains supporters through the Projects Manager’s community since experience has proved that inadequate or incomplete Geotechnical Investigation during the tendering stage can have a severe impact on a project’s schedule and overall cost. Moreover, managing geotechnical risks also helps to increase safety levels in siteworks. We need to keep in mind that geotechnical risk cannot be avoided and ignored but it can be managed and mitigated. Taking all the above into consideration it is recommended that a detailed Geotechnical Investigation program is proposed at early stages of each project, following an in-depth desk study of all available information and site walk-over surveys. It must be highlighted that the above post and its recommendations are to be read in conjunction with site specific available information and with critical thinking. In all cases, the Designer should set strict guidance for adequate Geotechnical Investigation in line with project specifications and international standards. Clayton, C.R.I. (2001) Managing geotechnical risk, Thomas Telford. 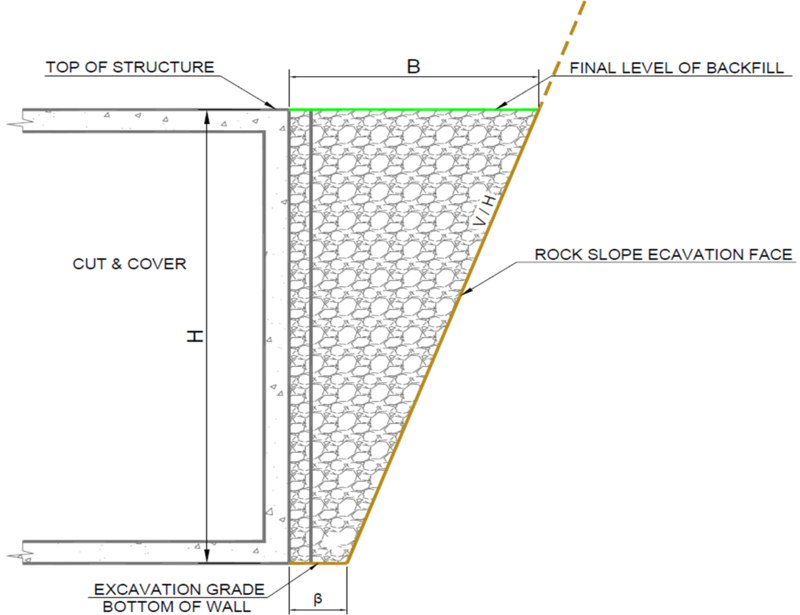 A common design issue many Geotechnical Engineers have come across in their career is the estimation of earth pressures on a Cut and Cover (C&C) sidewall located close to a rock cut. Usually, a C&C structure is designed and constructed close to an open excavation slope (supported or not) and then covered over with backfill material when construction of the structure is complete. The specific course discusses a theoretical design case of a C&C in a stable rock cut and how the lateral earth pressures on the structure’s sidewall could be estimated. Active and passive earth pressures are the two stages of stress in soils which are of particular interest in the design or analysis of shoring systems. Active pressure is the limiting condition in which the earth exerts an outwards force stress on a retaining system and the members tend to move towards the excavation. Passive pressure is a limiting condition in which the retaining system exerts a stress on the soil with displacements towards the soil. Since soils have a greater passive resistance, the earth pressures are not the same for active and passive conditions. When a state of soil failure has been reached, active and passive failure zones, approximated by straight planes, will develop as shown in the following figure (level surfaces depicted) but at different displacements. -The Coulomb theory which provides a method of analysis that gives the resultant horizontal force on a retaining system for any slope of wall, wall friction, and slope of backfill provided. This theory is based on the assumption that soil shear resistance develops along a failure plane in the soil mass. 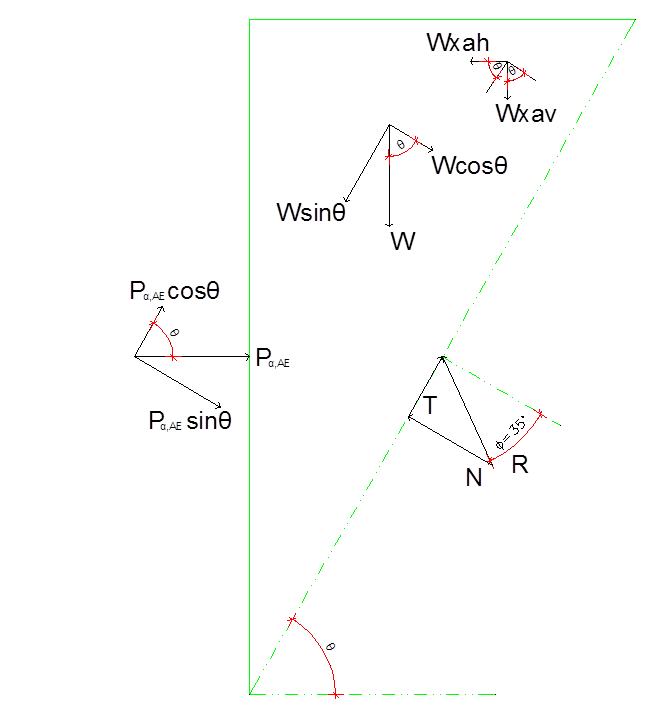 The wall friction angle (δ) value is always less than the internal angle of shear resistance (φ) one. It is common practice to assume a wall friction angle value of δ = 1/3 (φ) to 2/3 (φ). It must be noted that as wall friction increases, lateral earth pressured decrease. The above theories calculate earth pressures when an “infinite”soil mass exist behind the retaining system, but is this pressure the same when limited soil backfill is placed behind the retaining system? Such a case can be found in stable rock cuts with limited excavation behind the retaining wall. As stated above, during the design stage of a C&C structure, the Geotechnical Engineer is commonly requested to provide the Structural Engineer with the estimated (active) earth pressures on the structure’s sidewall due to the backfill. A typical cross section of a highway C&C which will be studied is presented in Figure 2, below. The geometry and geotechnical properties of the backfill area are given in Tables 1 and 2, respectively. The geotechnical calculations are conducted under the assumption that the active earth pressures exerted on the sidewall derive only from the backfill material since it is considered that a stable rock cut or an in situ permanent soil nail reinforced wall exist, consequently, the corresponding slope earth pressures would be practically zero. The interface friction angle between the backfill material and the sidewall was taken conservatively equal to zero based on the assumption that Expanded Polystyrene (EPS) will be applied on the sidewall. Based on Coulomb’s theory, the forces acting on the C&C sidewall were the ones described below and presented in Figures 3 and 4. -The backfill self weight (W). It must be noted that the self weight of the backfill material to be placed above the C&C roof slab was also taken into account. 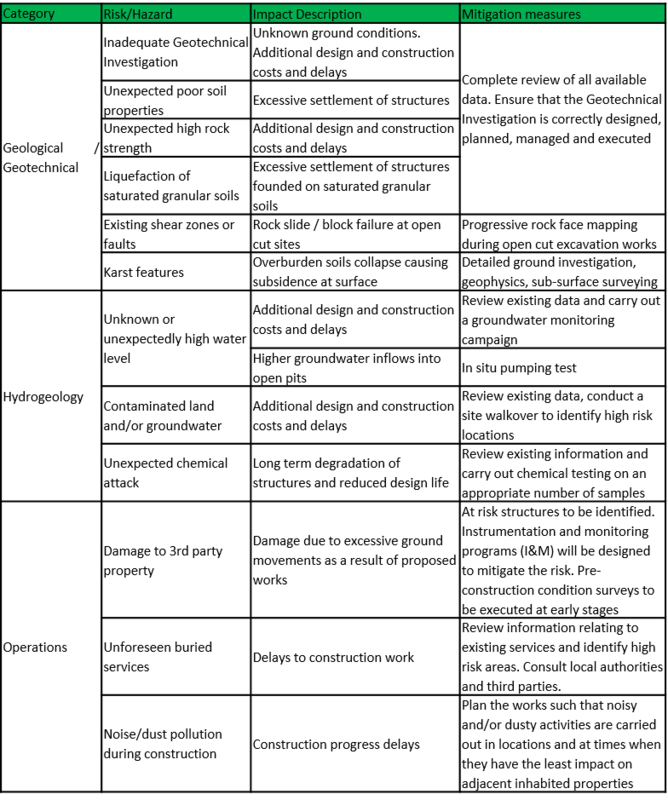 -The resultant force (F) acting on the failure surface. The two components of that force are the normal force (N) and the friction (T). It must be noted that the sliding surface was considered cohesionless (c=0 kPa). -The active earth pressure (Ρα) acting on the sidewall. Due to the presence of the EPS as described above, the resultant active earth pressure was considered acting normally on the sidewall. -In the seismic design case, the normal inertia forces (normal and horizontal) of the backfill. Due to the geometry of the backfill area and the aforementioned assumptions, the active earth pressures couldn’t be calculated under the assumption of a failure plane at 45°-φ/2. 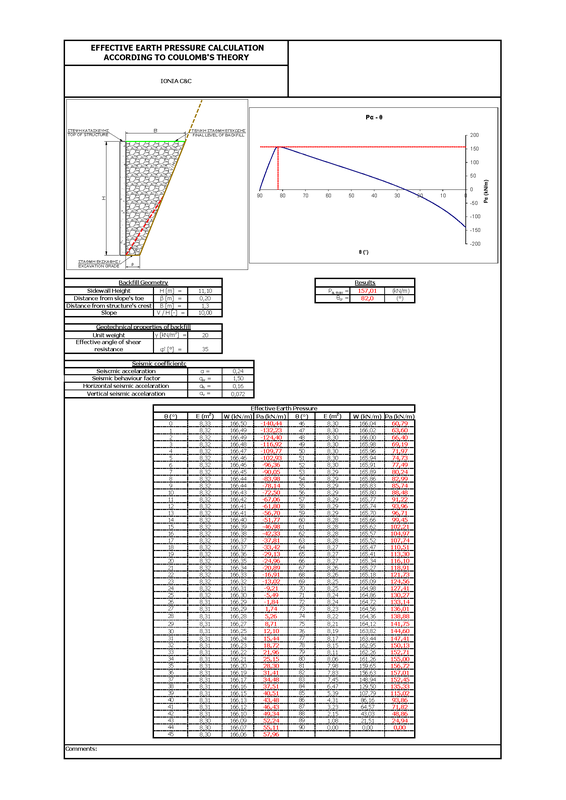 For that reason, a generic spreadsheet was produced for calculating the earth pressures for each straight failure plane. 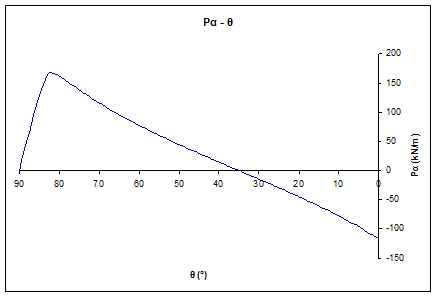 The results in the form of charts are presented in the following Figures 5 and 6. Detailed input and output are shown in Figures 7 and 8. If the backfill geometry isn’t taken into consideration and Rankine’s theory has been followed blindly, assuming that the failure plane would be at 45°-φ/2, a critical angle of θcr = 27,5° would have been calculated with a resultant pressure of Pa = 1/2xkaxγxH2 = 333,9kPa (static conditions). That means that the estimated earth pressures would be almost twice (100%) the probable ones leading to overdesign. The estimation of lateral earth pressures on structures is a common problem in geotechnical engineering, especially in the case of complex geometries defined by other geotechnical designs (usually stabilization measures) in close proximity. The specific note presented a theoretical design case where the estimation of active earth pressures and their magnitude following Rankine’s theory on a C&C sidewall couldn’t be established due to backfill complex geometry. 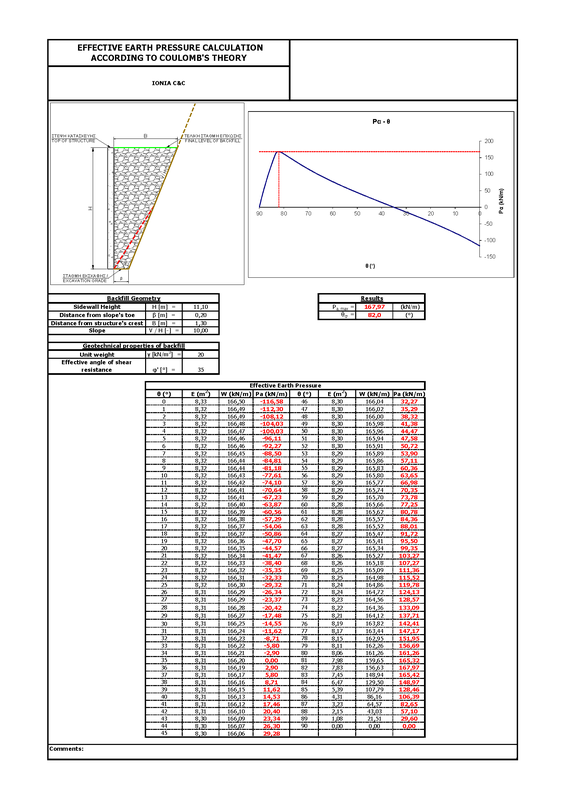 A spreadsheet has been elaborated for design purposes in order to estimate, through repeated iterations, the critical angle of failure plane for which the maximum earth pressures on the structure occurred. The backfill material is considered to be of cohesionless nature without creeping phenomena. There is never a rule of thumb and empirical approaches should be followed with engineering judgement since each design is unique and must always be treated as such. It must be highlighted that the above note and its recommendations are to be read in conjunction with site specific available information and engineering judgement must be implemented in all design stages. Monitoring of earth pressures in such situations could enlighten more the theoretical approaches. The views expressed in this note are only informative and should be used with great care in design situations. Steven F. Bartlett (2010), Examples of Retaining Walls. Earth Pressure Theory. An anchor is a structure consisting of a tendon free length (designed to satisfy overall structural stability) and a restraint (designed to transmit tensile forces to the surrounding ground). 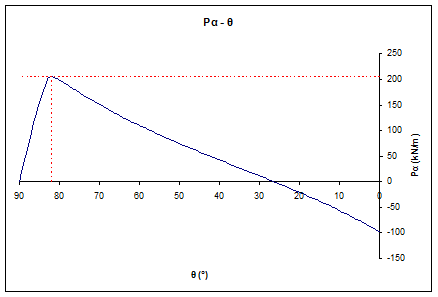 Two ways of determining the design pull-out resistance Ra,d are discussed in EC7 ; the first one refers to the pull-out resistance derived from the results of tests on anchorages and the second one is based on calculations [EN 1997-1 §8.5.1 (2)]. In this short presentation, we are going to examine the external resistance of a ground anchorage and, more specifically, the methods for estimating the bond strength (qu) between the grout and the surrounding rockmass inserted into the geotechnical design. The case of rock anchorages and related dependencies are also going to be discussed. The pull-out capacity of an anchor installed in a grouted anchor hole is affected by the size of the anchor hole (i.e., perimeter and length) and the ultimate bond strength, qu. The bond strength is the mobilized shear resistance along the rock-grout interface. size of the grouted zone. As previously mentioned, the case of anchorages installed in rock and gravity grouting will be discussed. 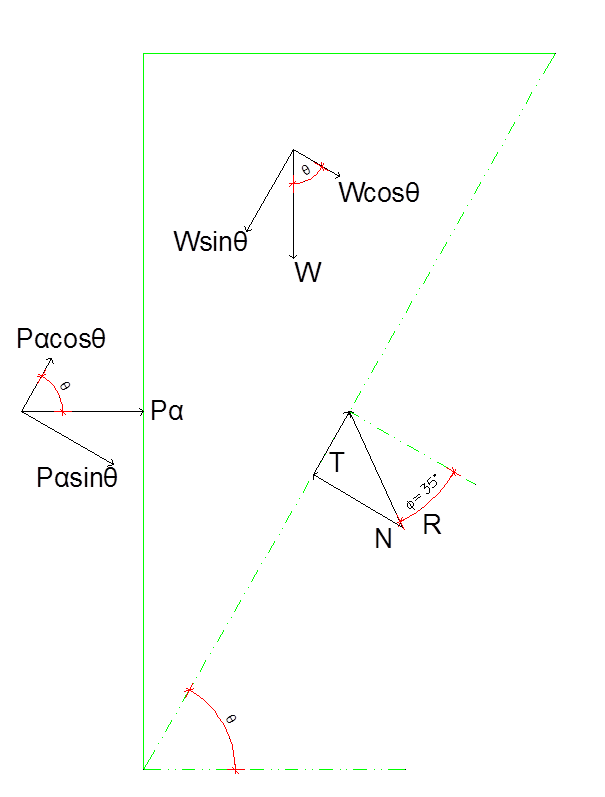 According to BS 8081 , “Anchorage pull–out capacity for a given ground condition is dictated by anchorage geometry. The transfer of stresses from the fixed anchor to the surrounding ground is also influenced by construction technique, particularly the grouting procedure, and to a lesser extent the methods of drilling and flushing”. Four (4) different types of grouting are presented. Type A anchorages consist of tremie (gravity displacement), packer or cartridge grouted straight shaft boreholes, which may be temporarily lined or unlined depending on hole stability. This type is most commonly employed in rock and very stiff to hard cohesive deposits. 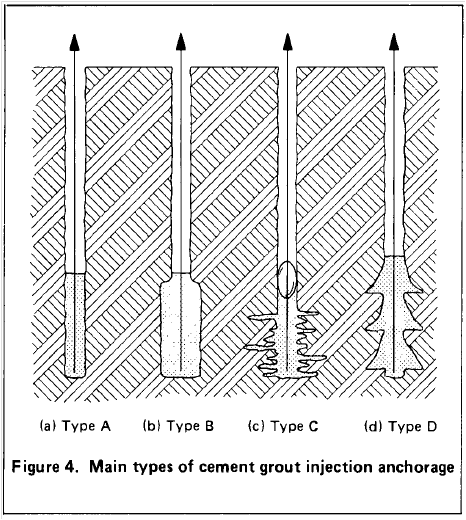 Type B anchorages consist of low pressure (typically grout injection pressure pi < 1000 kN/m2) grouted boreholes, via a lining tube or in situ packer, where the diameter of the fixed anchor is increased with minimal disturbance as the grout permeates through the pores or natural fractures of the ground. Type C anchorages consist of boreholes grouted to high pressure (typically pi > 2000 kN/m2), via a lining tube or in situ packer. The fixed anchor length is enlarged by hydrofracturing of the ground mass to give a grout root or fissure system beyond the core diameter of the borehole. Type D anchorages consist of tremie grouted boreholes in which a series of enlargements, either bells or underreams, have previously been formed. This type is employed most commonly in firm to hard cohesive deposits. Whilst anchorage types A to D can all be applied in rock, the straight shaft tremie or packer grouted type A is the more popular in current practice, on the basis of cost and simplicity of construction. According to FHWA0-IF-03-017 , “Typical values of ultimate bond for drilled and grouted nails installed in various soils and using different drilling methods are presented in Table 3.10. The values in this table correspond to gravity grouting only. Table 3.10 allows the designer to estimate bond strengths by entering the name of common rock types and soils described by their geologic origin (e.g., colluvium, moraine, etc.) and the construction (drilling) method employed. International literature provides a wide range of empirical correlations for the estimation of ultimate shaft resistance based on the compressive strength of rock (UCS). It must be noted that the anchors are considered as small-diameter piles bored into the ground as a simplistic approach. The following three empirical correlations are discussed in this note. Three typical rock types will be examined as an example. These are Basalt, Limestone and Weathered Shale. 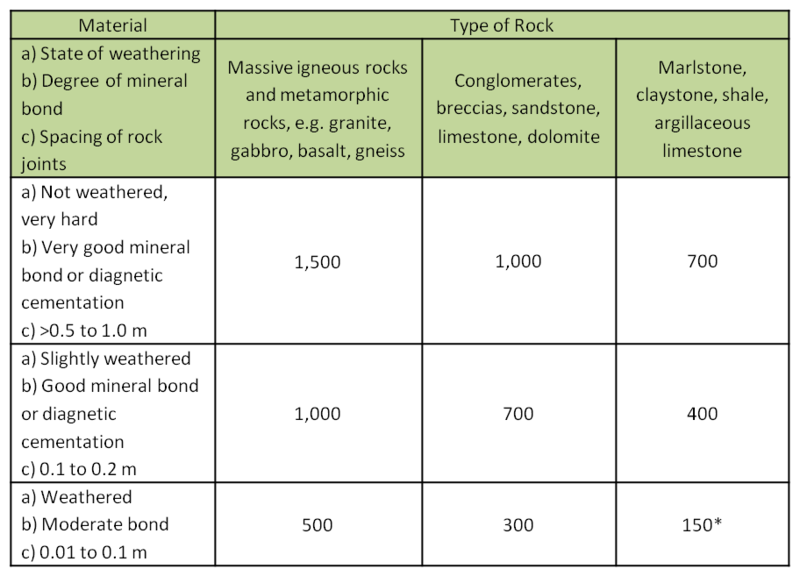 The typical values of these types of rock materials are summarized in Table 2, below. Table 2: Rock types and geotechnical properties Note: Typical values for unit weight and UCSint / mi are taken from international literature and RocLab software (RocScience), respectively. The following table summarizes the estimated ultimate bond strength (qu) based on the aforementioned international standards and literature. Taking into account the generic in situ conditions of a rockmass (weathering, fracturing) and the modified Hoek and Brown criterion  the following values for the ultimate compressive strength of the rockmass (UCSrm) are calculated for a slope of 10-30m high, a GSI range of 40 to 60 (typical for these types of rocks) and a disturbance factor of 0. It has to be noted that regarding the disturbance factor and according to Hoek E. , a value of 0 has been considered as more representative since the bonded length of an anchor extends beyond the excavation face (disturbed zone) and the small hole diameters guarantee a minimum disturbance of the surrounding rockmass. The ultimate bond strength has been recalculated based on the values for the rockmass and the results are summarized in the following table. According to Ostermayer H. and Barley T. , the following values of the ultimate bond strength are proposed for rock type materials depending on their weathering, mineral bonding and spacing of rock joints. There are many international standards and literature references with regards to the ultimate bond strength estimation for rock anchorages. The above short study presented and discussed several of them and concluded that the FHWA guidance (Elias and Juran, 1991) and the recommendations by Ostermayer and Barley correlate well with all empirical equations examined when the unconfined compressive strength of the rockmass is used instead of the intact one meaning that weathering and joints characteristics/condition are taken into account. Moreover, the equation proposed by Reese and O’ Neil correlates better with the above mentioned recommendations. In all cases, according to Ostermayer H. and Barley T. , for bonded lengths more than 6m, the progressive debonding phenomenon should be taken into account and the recommended values should be reduced accordingly. It must be noted that due to the high dependency of the bond strength to the rockmass unconfined strength, the second must be carefully estimated based on detailed site investigation. However, based on available research studies and international literature  there are other factors that affect the mobilization of the bond strength of drilled shafts such as the rockmass elasticity, the diameter of the shaft, and the initial normal stress of concrete which have not been taken into consideration in this note for simplicity reasons. Further to that, Carter et al. (2008)  have established that the Hoek-Brown criterion tends to underestimate the shear strength of rock material for the lower end of the rock competency scale (i.e. weak rock); “This is largely because block size and incipient strength is such that rock mass behavior in these domains tends not to be controlled by interlock shear strength but rather by material strength. At the low end of the rock competence scale (UCSint <15MPa and GSI generally <30) discontinuities play less of a role and rockmass strength tends to matrix strength.” This means that rockmass properties estimated based on the Hoek-Brown criterion as modified by Carter et al. are considered to be more representative and, in general, will lead to a more economic design. It must be highlighted that the above note and its recommendations are to be read in conjunction with site specific available information and engineering judgment must be implemented in all design stages. In all cases, the Designer should set strict guidance for adequate testing prior to anchors installation and proof/verification tests should be conducted to ensure the proper installation by the Contractor in line with project specifications and international standards. The views expressed in this note are only informative and must be used with great care in design situations. Carlos A. Lazarte, Ph.D., P.E., Victor Elias, P.E., R. David Espinoza, Ph.D., P.E., Paul J. Sabatini, Ph.D., P.E. (2003), “Geotechnical Engineering Circular N0. 7 – Soil Nail Walls”, Publication FHWA0-IF-03-017, Federal Highway Administration, Washington D.C.
 Hoek, E., Carranza-Torres, C.T. and Corkum, B. (2002), “Hoek-Brown failure criterion – 2002 edition”, Proc. North American Rock Mechanics Society meeting in Toronto in July 2002. Hoek, E. (2012), “Blast Damage Factor D”, Technical Note for RocNews, Winter 2012 Issue. Ostermayer H., Barley T. (2002), “Geotechnical Engineering Handbook, Volume 2: Procedures”, Ernst & Sohn Publications. Khaled H. Sharif, Shadi S. Najjar, Salah Sadek (2010), “Side Friction along Drilled Shafts in Weak Carbonate Rocks”, Art of Foundation Engineering Practice, ASCE. Carter, T.G., Diererichs, M.S. & Carvalho, J.L. (2008), “Application of modified Hoek-Brown transition relationships for assessing strength and post yield behavior at both ends of the rock competence scale”, 6th Int. Symposium of Ground Support in Mining and Civil Engineering Construction.